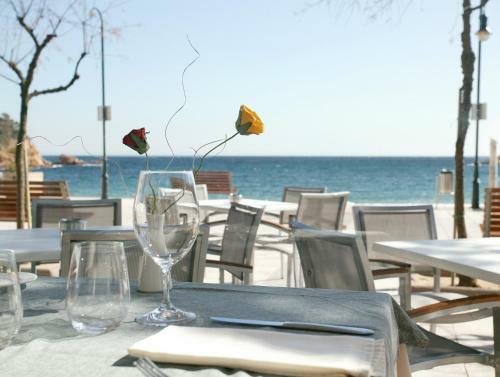 Das kleine familiengeführte Hotel Tamariu erwartet Sie im malerischen Ort Tamariu mit Blick auf den Strand an der Costa Brava. Sie wohnen unweit der französischen Grenze. Freuen Sie sich auf erholsame Tage im Tamariu. Dessen komfortable Zimmer sind lichtdurchflutet, komplett klimatisiert und verfügen über kostenfreien Internetzugang über LAN, ein vollständig ausgestattetes Bad sowie einen eigenen Balkon. Sie entspannen an einem der gepflegtesten Strände der Costa Brava, von dem Sie nur wenige Meter trennen. Erleben Sie das Flair einer ruhigen Bucht, die Tamarindenbäume umgeben. Im Restaurant Tamarius kosten Sie frische Meeresfrüchtespezialitäten und eine breite Palette an Gerichten aus aller Welt. Am Abend genießen Sie auf der hübschen Bar mit Terrasse die Aussicht auf das Mittelmeer mit seinem klaren Wasser. Sie schauen direkt auf den Strand des einstigen Fischerortes. Verschiedene Arbeitsvorgänge haben ein wenig länger gedauert (z. B. ein-/ auschecken). Hôtel situé face à la mer. Personnel très agréable et professionnel. Nous reviendrons avec plaisir. La ubicacion la amabilidad del personal el desayuno muy completo y de calidad han sido dos días magníficos. There is not much parking immediately near the hotel but you only have to drive a hundred metres up the road to find plenty of public parking spaces. What a wonderful part of the world a true paradise. The friendly and very helpful staff made our stay a restful and rewarding experience. The resutrant was high class. The Wi-fi was slow at night and hard to connect. It was also annoying have to log in and out. The shower went from very hot to very cold with out warning. Modern,friendly,very clean and comfortable. Excellent food. Quiet and relaxed. Petit village tres mignon et vu magnifique sur la mer ! Petit commerces a proximité et depart de chemins de randonnés .. Personnel de l'hotel vraiment tres accueillant et serviable ! La ubicación es perfecta, el personal es muy agradable y atento.La habitación es amplia. son emplacement idéal face a la mer. L'accueil est parfait et la possibilité de prendre une douche et se changer avant de repartir est très appréciable. Fantastisk smuk Beliggenhed,god mad,meget imødekommende personale. The hotel is right on the beach in the picturesque bay of Tamariu. The owners are delightful people who will go out of their way to ensure you have a pleasant stay. The food is excellent. We had a special Saturday dinner and jazz evening, with 4 courses and any drinks you wanted for Euros 35 per head. The breakfasts, in the lovely room overlooking the sea, are excellent with a wonderful slection of breads, fruit, meats, cheese and eggs to boil yourself. More elaborate egg dishes can be provided from 9am onwards. The rooms are well appointed and comfortable with efficient air conditioners/heaters. The bathrooms are large and have everything you need.